When he reaches Connie’s she looks upset. She won’t meet his eye and sits on the edge of the sofa staring at her clasped hands. Judd stares at her for a few moments. He sits down in the armchair near the sofa and clears his throat. Connie looks at him sharply then away. Her breath catches on a sob and she raises shaking hands to her mouth. “So why are you telling me this now?” Judd asks, looking at her. She sits forwards and looks him in the eye, her gaze filled with tears. “He had something planned,” Judd says. Judd doesn’t say anything, he just sits back in the armchair and thinks. The past few days rewind through his mind, everything that’s happened since Right Stuff called him about Charlie being missing rush through his brain. Every moment, every interaction runs around his head and with the new information he sees it all in a different light. Charlie had known Judd and Obo would go to war. There was no doubt in Judd’s mind that Charlie knew. It wasn’t just Obo’s obsession with getting more power that would drive them against each other. Judd realises that Charlie had thought much further about all of this, about how both Judd and Obo would react to the news and what they would do. It is no secret that the pakis hate the blacks even though they should be on the same side against the other racist shits of Britain. It was also no secret that Obo hates Judd, that he is intensely jealous that Judd comes from a proper loving family who love and support each other. It’s something that Obo had never had and had never understood. But Obo wants it for himself anyway, even if there are problems along the way. But it’s something that Obo can’t get, will never get because he doesn’t know how to be warm and loving and supportive. Charlie had also known, just like Judd does, that Obo would never back down from the challenge of taking over. He just isn’t that sort of person. He has always kept going and going until he gets what he wants and trying to take over Charlie’s turf would have been no different. Judd had known it himself. And from the instant that Obo had pulled the gun at him in their first meeting Judd had known that Obo would make sure that everyone would end up tooled up. That route would have lead only to the eventual death of one of the two. It would have been Judd, he knows this. He doesn’t have the burning need to take a life, to prove himself to everyone else like Obo does. For a moment Judd is glad that he has made a better choice for himself. And with that thought comes another realisation to Judd’s mind. He realises exactly how smart Charlie is and has been. He had always known that Charlie was smart and could read people but after hearing everything Judd realises exactly how deep Charlie’s skills run. Charlie knows Judd better than he knows himself. Charlie had seen the doubts that niggled at Judd’s mind and cracked them wide open. Judd was not, is not, cut out to be a drug dealer, not in the long term. He would never have been able to pull the trigger of a gun when it was pointed at someone else, not even in the heat of one of his strongest flares of anger. Judd just isn’t wired that way and Charlie must have seen that. Charlie knew that Judd would eventually come around to the way of thinking that he wanted. He had gone to university after all, he had been taught to think and adapt and take new ideas and actually absorb them instead of letting them simply wash over him and forgetting about them the next day. Charlie had known that Judd would eventually see the light and get out of the drugs business. He knew that that change of thinking in Judd would come even quicker if he had Connie there to push things along. Someone in a position of authority is someone that Judd automatically listens to, especially if they’re sharing information that he wants and needs to learn. Charlie just exploited Connie’s position to get Judd to take the suggestions a little more seriously. More importantly Charlie had known which thoughts to manipulate in Judd’s mind so that he would listen and accept the suggestions that he was trying to make. Judd realises, even as he feels grateful to Charlie, that there is a lot more to Charlie’s actions than simply trying to get someone out of drug dealing and into a better job. Charlie wanted more territory, it was simple, and getting Judd to leave his patch open was a much better way of getting more territory than taking either him or Obo out and possibly causing a gang war. Doing things this way means that not only does Charlie get more territory but he gets to do something good at the same time. In a strange way, Judd realises, it’s Charlie’s attempt to do a good thing to make up for all the bad that he’s done through drug dealing at the same time as helping himself. And just like that it finally clicks in Judd’s mind. He finally understands why Charlie accelerated the process that was already beginning to happen. He understands why Charlie chose him to take the territory from. He was the easier target. He was the least vengeful and least ruthless of the two choices, despite everything that Judd had believed about himself. The facts are that Judd is never going to be as vengeful and ruthless as Obo or Charlie. He has something that they don’t, something that pushes him to act differently to them. He has alternatives, different paths that he can take to make his way in the world. The others don’t, they have no other path that they can take. For Judd dealing is something that he is doing, or rather was doing, until something better comes along. That’s what he has always told himself and it is actually true although it may have taken him longer to find that something else without Charlie’s machinations. But for Obo and Charlie dealing is their careers. It’s the only thing that’s open to them, the only way that they can make a living for themselves. They don’t do it because it’s easy like it is for Judd, they do it because they have no other choice. Charlie might once have had choices, Judd thinks, but he chose to ignore them and stay on the path that he had chosen for himself and as time had passed those other choices had gone and he was left with only dealing. A wave of gratitude suddenly rushes through Judd, surprising him. He had expected to feel angry, furious even, that someone was deliberately manipulating him into doing something that he doesn’t want to do. 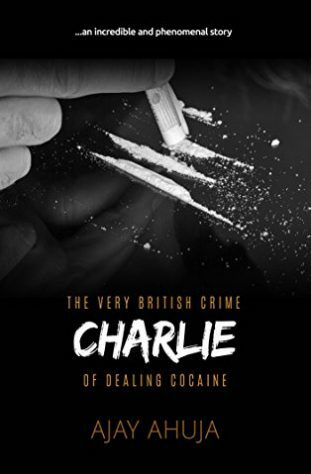 But instead he was only grateful that Charlie had gotten Judd to make the choices that he never made and get out of the drug dealing business for good. Judd looks at Connie. “I think I understand why you did it,” he says quietly. She looks at him, eyes wide and still full of tears. Judd reaches out and takes her hand. “You’re still mad though aren’t you,” Connie says. Judd purses his lips and thinks for a moment. She scrambles for her phone but her hands are shaking and she keeps dropping it. Judd leans forwards and puts the phone into her hands. He wraps her fingers around it and covers them with his own. He gently raises them to his mouth and kisses her fingers softly. He smiles and Connie breaths out slowly, her returning smile a little shaky but surer than it was before. She flicks open the phone, her hands steadier, and dials a number. Judd reaches forward and puts the phone on loud speaker. The sound of the ringing fills the small apartment. Connie looks at Judd for guidance. Judd takes the phone from Connie’s hands and holds it up to his mouth. Judd doesn’t wait for a response, he just hangs up the phone. He tosses it on to the cushions beside Connie and sits back in his chair. He heaves a great sigh of relief and relaxes, closing his eyes. He’s staying in Farlow, despite the possible problems. His life is here, his family, his friends, his degree course. And Connie is there too, and despite everything that she’s done he still wants to see what might happen between them. Besides, he needs to stay to look after Sally. Charlie might want him to leave Farlow, so might Obo, but Judd doesn’t intend to go anywhere. It might get hard, it might be tricky but he will find a way to live the life that he had always had in mind. And he can do it legally, without anything to hide. Judd looks forward to the challenge.